A Taiwanese government office is warning local PC vendors of a new Apple patent for its MacBook Air that could be used in legal action to try and stop the sale of ultrabook models. Last month, Apple received a U.S. patent for the exterior wedge-like design of its MacBook Air devices. The intellectual property office of Taiwan's Ministry of Economic Affairs, however, worries the patent could create legal problems for ultrabooks, given that the laptops also feature thin and light designs similar to the MacBook Air. "We are recommending that PC vendors be careful," said Xue Shuhua, a public relations staff member with the office on Wednesday. Xue noted that Apple has already targeted Taiwanese smartphone vendor HTC in several patent-related complaints that have sought to ban the import of the company's phone into the U.S. The legal battles have recently delayed the shipments of HTC's newest smartphones to the country, the result of a U.S. International Trade Commission ruling. "Companies that manufacture ultrabooks should avoid the Apple patent when producing their products," Xue said. The office plans to hold a meeting with Taiwan's PC manufacturers, but has yet to decide when or which companies to talk with. Taiwan's PC vendors include Acer and Asus, both of which sell ultrabook models in the U.S.
Acer said in a statement, "Apple's patent on the teardrop profile design is different to Acer's ultrabook design. 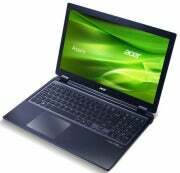 Hence, currently, the patent has no impact on Acer." The warning is just the latest move by Taiwan's electronics industry to try and fend off patent disputes. Last year, a major Taiwanese research institute announced it was creating an intellectual property "bank" to acquire patents in Taiwan and abroad as a way to protect vendors from further patent infringement lawsuits. Intel, which defined the ultrabooks category, declined to comment.